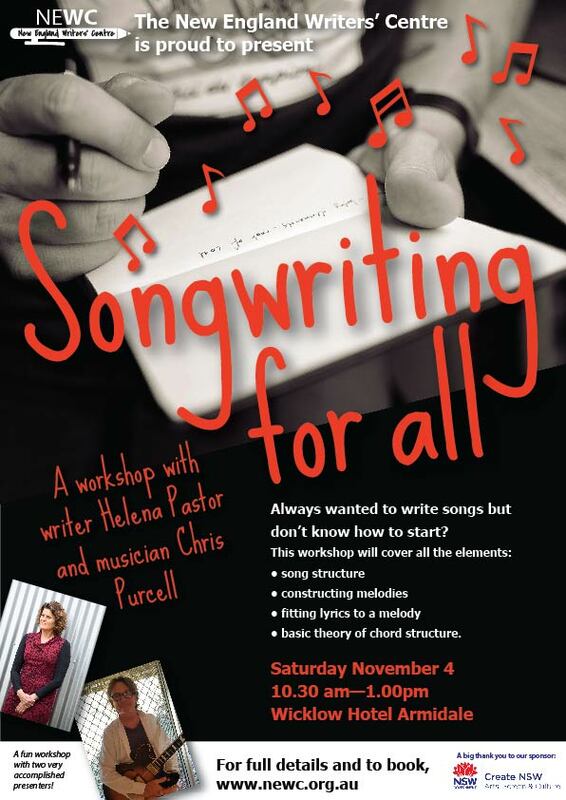 On the 4th November, composer Chris Purcell and I will be presenting a songwriting workshop at the Wicklow Hotel in Armidale. This workshop has been organised through my association with the New England Writers’ Centre, and NEWC have done a fabulous job with the poster. Chris and I recently finished our first collaboration together, a song cycle called ‘Lullaby & Lament’ – where I wrote the lyrics and Chris set them to music. Rather than following the traditional path of song cycles about myths, classical tragedies and unrequited love, the songs from ‘Lullaby & Lament’ cover topics such as grief, loneliness, divorce, estrangement and death, as well as love and happiness – universal themes written in words and music that go straight to the heart. Chris and I both write songs on our own as well, but we enjoy collaborating and are currently working on our second project. We’re really looking forward to sharing our songwriting skills with the people who come along. See you there!